When considering a career path, culinary arts are a vast and intriguing field. Culinary arts are often thought to be a career specifically for those with an avid interest in cooking or a passion for the restaurant industry. However, it is an all-encompassing field for those who wish to pursue career opportunities within a wide range of organizations. 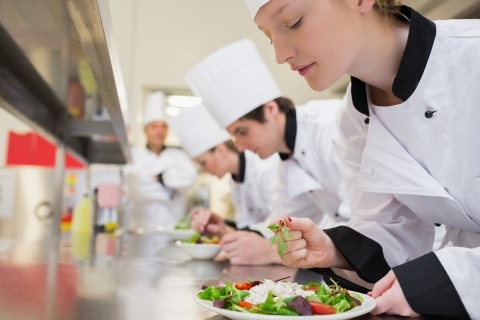 The culinary arts field is gaining momentum in California for a variety of reasons. Everything from California's restaurant industry and tourist attractions to California's media presence factor into the many draws for California's culinary cuisine. Also on the rise is food education and nutritional awareness. California is considered to be among the leading areas for food and nutritional science, diet programs and culinary diversity. What Does a Career in Culinary Arts Entail? The end goal of most culinary arts training programs is to be able to prepare a meal that is both visually appealing and tasty in a variety of food service settings. Culinary artists must acquire training on everything from food science and nutrition to preparation and protocol. Culinary arts education provides the tools needed to start from the ground up working within the food preparation industry. Most students will matriculate to working in restaurants. After which, students may also move on to jobs within delicatessens or widely recognized institutions like hospitals or hotels. Culinary artists are known as ‘cooks’ or ‘chefs’ and often work within a network of kitchen staff. •	Food and beverage manager, devising menus and organizing food supplies within an eating establishment, care home, store or hotel. •	Marketing design specialist, working in partnership with managers or owners at eateries on menu layout and design as well as food service rules. •	Restaurant manager, overseeing an entire food establishment. •	Culinary entrepreneur, working to invest in certain facets of the food industry be it restaurants, bakeries or novelty/specialty foods. •	Food marketing specialist, photographing or presenting food within the context of books, magazines, brochures or other promotional vehicles. •	Food critics, providing critique and feedback on notable foods, food trends, chefs and restaurants through a variety of publications or media tools. •	Product design analyst or manager, working to create or pioneer kitchen tools for household use or professional use within restaurants, grocery stores. •	Culinary arts writer, creating cookbooks, how-to books or online for-profit video guides for desirable recipes. •	Cooking teachers, educating others on the culinary arts at various levels (all the way from grade school home economics courses to adult education in the culinary arts). •	Culinary sales, marketing tools, ingredients or supplies to chefs or food service establishments. A career in the culinary arts field open stores for further certification, for travel and for career advancement. Some may find the idea of starting in a remedial job within the food service industry unappealing. However, many great culinary artists had to start somewhere. The basic skills taught in career training programs, apprenticeships and culinary education institutes provide the necessary framework for a successful and profitable future career. When weighing the pros and cons of working towards obtaining culinary art certification, consider the long-term benefits. With perseverance and curiosity, many students can move forward and achieve great things in either leadership or staff-related food service roles. Additionally, in the modern age of media and social media, culinary arts graduates may take their knowledge and personal flair and apply it to online businesses, promotions, video guides, YouTube videos or other for-profit social media outlets. Everything from publishing an Amazon Kindle of recipes for cooking tips to straightforward how-to guides can provide additional mediums through which to build a career in the culinary arts. Even a public access cooking television show can provide the backbone for a successful culinary arts career. Approaching culinary education can be done through a variety of training programs. Such training programs include cooking schools, culinary arts education or chef training. All of these programs prepare individuals for careers as culinary artists. Double-checking on accreditation of institutions and training programs is pivotal as program certifications vary from state to state and Institute to Institute. The American culinary Federation is responsible for accrediting chef training programs and sponsoring apprenticeships programs and cooking schools across the United States. In the state of California, culinary education can be obtained with the prerequisite of a high school diploma or postsecondary level, after high school, certification including associates or bachelors degree, etc. post secondary level culinary education is usually offered at universities, community colleges, culinary institutes, trade schools, vocational or technical schools or career training colleges. Define the best college for you, consider the area in which you intend to work within the field of culinary arts. California's hub cities for popular and desirable cuisine include California's biggest tourist attraction cities as well as its more diverse ethnic communities offering a wide variety of food and food service jobs. Two of California's best metropolitan hub cities for culinary arts are San Francisco and Los Angeles. The best employment and career opportunities mesh with the best earning potential in these areas. However, keep in mind that the amount of flocking to large and popular cities for culinary-related jobs creates more job completion as well as higher costs of living. Therefore, taking one's culinary skills and experience and placing oneself in one of California's towns or cities under development may be prudent. Placing oneself in an area of growing interest and tourist attraction may be beneficial. Though culinary arts certification does not usually require a Bachelor’s degree, it can be beneficial to have a higher academic standing. A minimum Associates degree can open more doors towards culinary certification as prior learning and partial academic credit can be used towards further accreditation. Most culinary arts training programs provide the graduates with the background needed to be, bakers, chefs, pastry chefs, caterers, restaurant managers, private chefs or cooking teachers. When potential culinary arts students weigh the pros and cons of getting involved in the field, one of the large cons involves the notion that a job in the field will imply backbreaking and low-paid work without the option for advancement. However, while starting points may be less than ideal as students gain workplace experience, it does not mean that there is not a higher paying and greatly rewarding future lying in wait with hard work and perseverance. Many culinary arts students move forward towards professional careers in higher-ranking positions, eventually working their way up to restaurant managers, personal chefs, independent businesspeople and entrepreneurs or owners of their own small businesses (i.e. catering, bed and breakfast/hotel management, recipe/cookbook gurus and more). Depending on which aspect of the culinary arts world you are drawn to, research California's culinary training institutions to find the one most geared towards your personal goals. Top California educational institutes providing certification in the field of culinary arts include the Art Institutes System of schools in San Diego, the Institute of Technology and many more. While apprenticeships may be difficult to come by, they are often an excellent starting point for culinary arts students to gain firsthand experience and training. Many students feel that hands-on experience coupled with culinary education has served them very well as their careers in the field progress. Specializing in only one part of the kitchen is often par for the course in culinary arts certification programs. While it is beneficial to get as much experience as possible in a specific facet, successful chefs usually have specialty niches that began as targeted hands-on study. Apprenticeships usually take place within a staff kitchen in a restaurant, catering company, hotel or food service preparation area. Enrolling in an apprenticeship program allows trainees to work alongside experienced staff while learning new skills, building relationships and receiving help and input. As an apprentice, it is your duty to take creative initiative, pay close attention and have an avid curiosity regarding obtaining professional experience and culinary know-how. Apprentices also have the opportunity to learn additional business skills including managing cost of food supplies, ingredients organization and management. Additional duties may include menu design and arrangement, staff time budgeting and developing one’s own cooking abilities or recipe schemes. Modern media plays a huge role in the types of careers and work expectations one can have within the culinary arts field. California is among the leading states, if not the leading states, for crossover talent from the world of cooking and restaurant management to the world of entertainment. Food media studies are a growing area of research and expertise within the industry, with new certification programs appearing in large numbers across the state of California. The end goal of such certification programs is to combine commercial and media appeal of food with the backbone of culinary arts—visually appealing and palatable food. Presentation is key in attracting customers and the openings for talented individuals who can combine media literacy with culinary arts is growing. In the state of California, as well as across the country, there is a blossoming climate of culinary diversity and a growing niche for those who are certified in culinary arts for a variety of different food service outlets. Among California's top culinary arts related careers currently considered most profitable, pastry and baking arts, hospitality management, culinary management, chef and kitchen work and educational instructor in the field of culinary arts are considered the more profitable jobs with the most long-term payoff. For most future chefs, the most rewarding aspect of culinary certification involves treating others towards culinary delicacies, one's own recipes and turning one's own joy of food and food styling into a lucrative career. The ability to pass on skills to future culinary apprentices, family, friends or the general public is also considered a great contribution to California's existing culinary attractions and industries. Acquiring certification in many facets of the culinary arts may afford graduates the opportunities to either further study abroad or work abroad. Culinary hubs like Germany, Italy and France often rank highly in the realm of desirable international opportunities for professional advancement. Enrolling in California’s culinary programs may grant students or graduates further career or educational paths in a multitude of international culinary schools. The best industry placement either inside or outside the United States depends on which particular area of specialty. There are four primary areas of study made available at the vast California culinary schools train for professions with the opportunity to advance into careers as food service managers, chefs, head cooks and bakers. Although these two major cities provide the most attractive backdrop for a career in culinary arts, training programs in many other California cities and towns are still greatly profitable and provide opportunities within other developing areas. Given California’s growing climate of award winning culinary experiences and diversity of cuisine, entering a niche market elsewhere is something to consider. Both Southern and Northern California provides excellent options for those looking to branch into food-oriented careers in many capacities. Projected employment for those certified within the culinary industry in California shows a 9.1 percent growth in 2014, as stated by the of Labor Statistics). Independent occupations like food service manager or chef are shown to continue salary growth between 2012 and 2022. California, in particular, offers a wealth of long-term opportunities for branching out after basic and advanced culinary certification. The ability to make a name for oneself is not a far-fetched or unrealistic goal in the long-term given the growing desire for new and unique presentations of culinary cuisine and original dishes.